I’m a process knitter. That is, I enjoy the process of making something just as much, perhaps more than, the finished product. I love how, with time and patience, a string can be become a useful, well-loved fabric. I love how I can transform the essence of time itself, each knitted object holding long conversations, quiet bus rides, contemplative moments, tears, even holding and transforming anxious or angry moments into something beautiful. Being more attached to the process and less attached to the product, I typically finish what I start. There are very few UFOs hanging around my house. And, let’s be honest, I’m frugal and refuse to buy new needles if I have a pair already, so those projects must get frogged or finished so I can move on to something else. But this year I became a rather, uh, serious knitter. What used to be a casual hobby became a near-obsession. I’ll forget my keys or phone, but I never leave the house without a knitting project in tow. Thus I now have more UFOs than ever. And last week I got a wild hair about finishing them ALL before the end of the year. Let’s do an inventory, shall we? Ah, the dragonfly washcloth. This is the most recent project, started in a moment of desperation when I needed a mindless project for some travels, but none of the others were travel-worthy. A good hour and this will be finished up in no time. No problem. 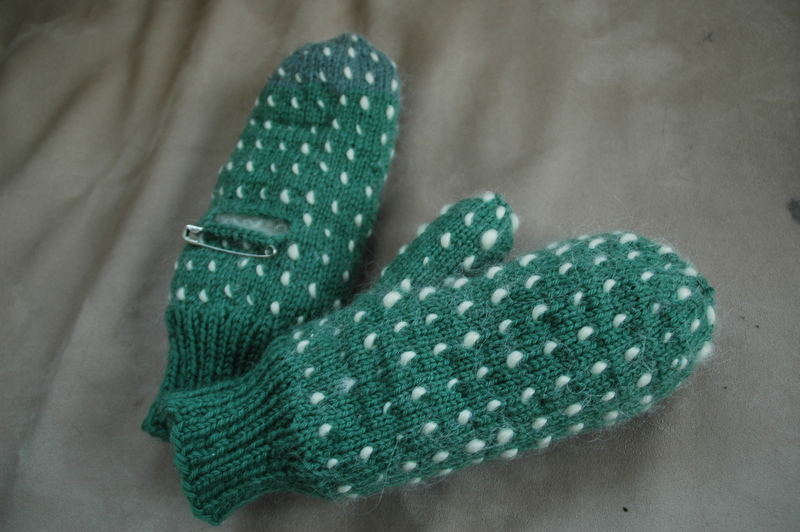 The thrummed mittens. These lovelies are lined with twisted pieces of wool roving. They’re puffy and delicious, so warm I want to crawl inside them. I just have one thumb and general finishing to wrap these up. I should get on it because I need these with the nearly sub-zero temps we’ve been having! P’s sweater. This is a funny story. 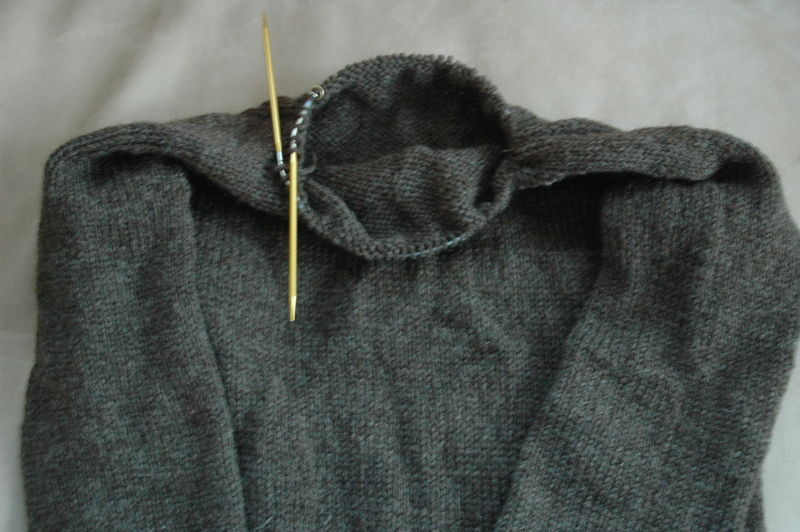 I made P a sweater earlier this year, but the neck came out a little feminine. I decided that I liked it. So I kept it and started another for him. Afterall, it was unlikely I’d be able to replicate my mistake. So I’ve been working on this for too long, all the while I’ve been enjoying my new super warm hand knit sweater. All I need to finish is the neck and collar. So close, yet so far away. 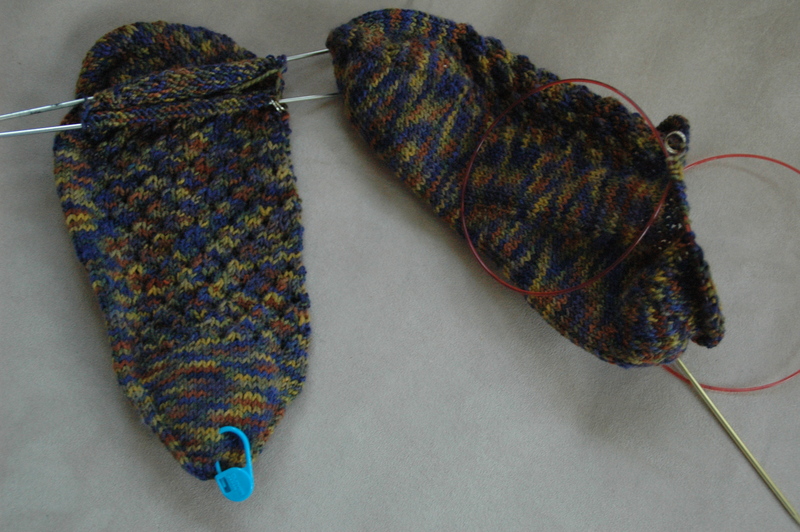 And here are the socks I started a few weeks ago. As socks make such excellent travel projects, never becoming too bulky and taking a while to complete, this has been my bus knitting for the past several weeks. All that remains is binding off. So why don’t I just finish up all these projects? Well, friends, it’s the fault of my Muir shawl. This super snuggly 100% baby alpaca project has been looming all year. It’s been ripped and reknit several times and this time I might actually finish. 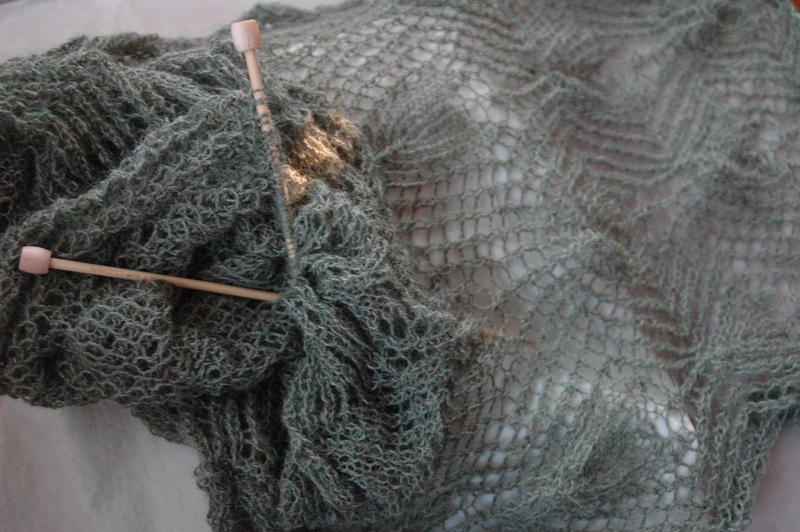 But the 32 row lace repeats take forever, and I can’t travel with it because it’s such delicate knitting. Everytime I take it from the house I mess up and have to frog several rows. Grr. So it’s been consuming all of my home knitting. I only have 1-3 repeats left (depending on my patience) and final finishing. It’s sooo close (comparatively) and I really want it done before I travel over winter break. I think it’d make such a comforting, packable and warm shawl for a plane ride. And then there is the top secret Christmas knitting that I haven’t even casted on yet. Can I do it? I hope so! 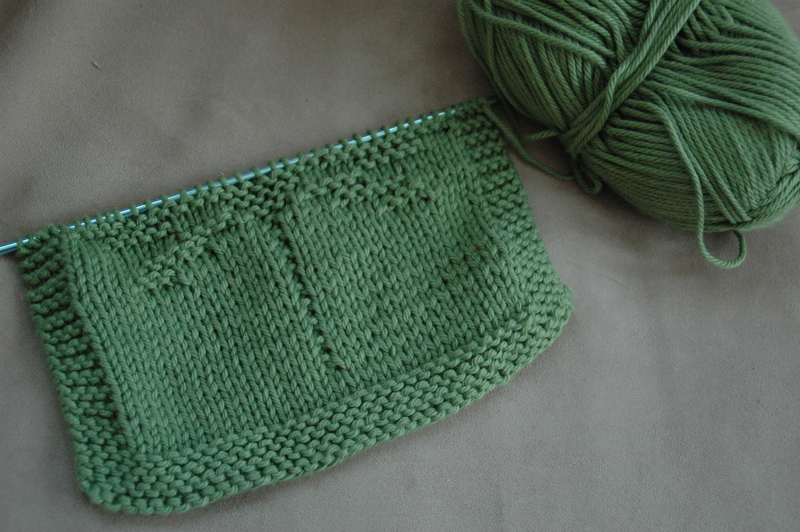 I want to start the year with a clean slate so I can cast on for the Cables Untangled Sampler Afghan. It will be my biggest project to date! What a process this will be.